The 100 Series is a perfect fit for solid set irrigation, pivot end gun irrigation, dust suppression and sports field applications. Anodized or Powder Coated units are available, which makes this a great option for mining or wastewater applications. The Nelson 100 Series Big Gun comes as a Full or Part Circle sprinkler with an 18°, 21°, 24°, or 43° trajectory (or 15°- 45° adjustable trajectory). Taper, Taper Ring, or Taper Bore Nozzles are available (TR not available for SRNV). 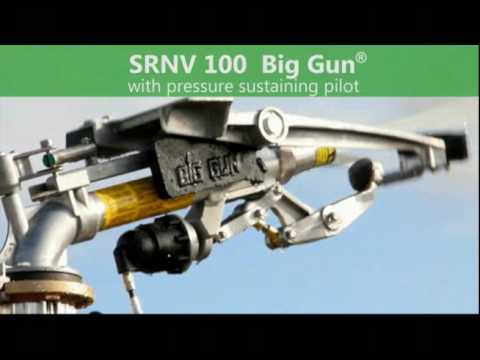 The SRNV100 is the field-proven SR100 with a nozzle valve incorporated. This is a great product that solves many center pivot problems: you can get extra acreage, flush out the system when needed and with no in-line valve there is no friction loss, no turbulence and no plugging. Low-Pressure Drive Vane Kit, Counterbalance Kit, Secondary Nozzle Kit, 12° Wedge Kit and the Stream Straightener Vane. Can be fitted to a QC Valve or 2” 800 Series Control Valve (QC not available for SRNV100). 2” FNPT or FBSP, 2 1/2” FNPT ANSI/DIN, Nelson or Euro Flange for the F100 and SR100 - and the 2” FNPT or FBSP for SRNV100. The Nelson Quick Coupler makes portable Big Gun® irrigation faster and easier than ever before. A quick twist attaches the gun and key to the valve. Simply connect the hydraulic assist and the gun goes into action. The shutoff and disconnect cycle is just as fast and easy. Combo of a Big Gun sprinkler and 800 Series valve (A2 B11 C3). No solenoid is needed for this gun-control system (when a booster pump is used). When traditional end guns aren’t an option, specify the Nelson Purge Valve to intermittently flush the end of a pivot to prevent solids from collecting that are not managed by the pivot sand trap.